At soon to be open mega-zoo called Eden, a virus is running rampant through the monkeys. They seem to die, only to awaken into fierce eyeball ripping killers. A tour group, the zookeepers and scientists all find themselves locked inside the grounds. The scientists are fearful that the virus will spread to the aviary and infected birds could escape to start an epidemic. Dr. Ellen Rogers (Kim Nielsen) is forced to turn her endangered animal sanctuary into a blood bath as undead, apes, giraffes, koalas and lemurs tear apart the park guests. 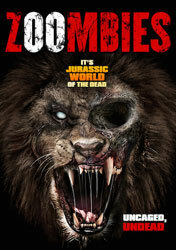 Zoombies is a missed opportunity, and I would love to see a remake with a little more care put into the final product. The concept for a horror film featuring zombie animals is a fresh concept, and hasn’t been overdone (which not something you can easily say in the zombie sub-genre). Zoombies is absurd, but never takes much of chance to revel in its own silliness, it’s too busy being a by the numbers zombie story. This is an Asylum production (creators of the Sharknado series), so normally I would let the sub-par CGI have a pass, but here it really undermines the whole film as the animals are rarely more that blurry blobs, not to mention a CGI gorilla that in no way matches the animatronic suit shown in other scenes. The film is an obvious rip-off/satire of Jurassic Park (1993), but everything just feels rushed and it never settles down long enough to have much fun. Only occasionally do we get things like zombie giraffes plucking people out of trees and tearing them in half, and it could have used a lot more scenes like that.